Unique double tassel 0.50cts diamond drop pendant set with 12 matching round brilliant cut diamonds. A unique 0.50 carat Diamond pendant, featuring a double tassel setting that gracefully displays the Round Brilliant cut Diamonds. The 12 perfectly matched G Colour, VS1 Clarity Diamonds are held securely yet tastefully within the bezel setting. The colour and clarity of each cascading Diamond is beautifully enhanced by this graceful setting. 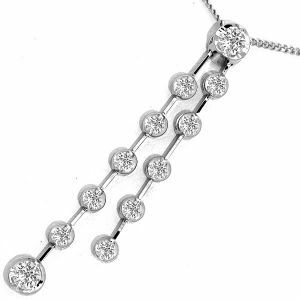 The Pendant is supplied with an 18-inch curb chain however, other lengths are available on request. The pendant and chain are 18 Carat White gold finish. Once lovingly crafted your pendant will arrive with you in approximately 4 weeks, meticulously presented in our bespoke packaging, ready for that perfect moment.